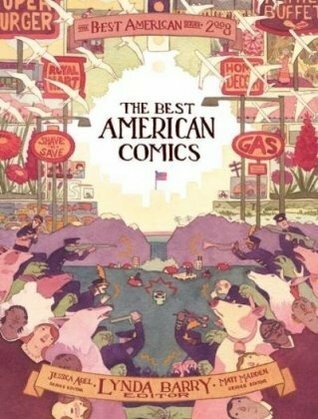 This newest edition to the Best American Series--"A genuine salute to comics" (Houston Chronicle)--returns with a set of both established and up-and-coming contributors. Editor Lynda Barry and and brand new series editors Jessica Abel and Matt Madden--acclaimed cartoonists in their own right-- have sought out the best stories culled from graphic novels, pamphlet comics, ne This newest edition to the Best American Series--"A genuine salute to comics" (Houston Chronicle)--returns with a set of both established and up-and-coming contributors. Editor Lynda Barry and and brand new series editors Jessica Abel and Matt Madden--acclaimed cartoonists in their own right-- have sought out the best stories culled from graphic novels, pamphlet comics, newspapers, magazines, mini-comics, and the Web to create this cutting-edge collection "perfect for newbies as well as fans"--The San Diego Union Tribune. This newest volume features luminaries like Chris Ware, Seth, and Alison Bechdel alongside Paul Pope's "Batman" and beloved daily cartoonists like Matt Groening. Lynda Barry is a writer and cartoonist whose comic strip, �Ernie Pook’s Comeek” celebrates its 30th year in print in 2007. She is a recipient of the Washington State Governor's Award for her novel, The Good Times are Killing Me, which she adapted into a long-running off-broadway play. The New York Times called her second novel, Cruddy, �A work of terrible beauty”. She received the 2003 William Eisner award for Best Graphic Album and an American Library Association Alex award for her book, One! Hundred! Demons!. She lives and works in southern Wisconsin. Jessica Abel is the author of the graphic novel La Perdida, as well as two collections of stories and drawings from her comic zine Artbabe. Matt Madden is a cartoonist and author of 99 Ways to Tell a Story: Exercises in Style. Their textbook about making comics, Drawing Words & Writing Pictures, is forthcoming.